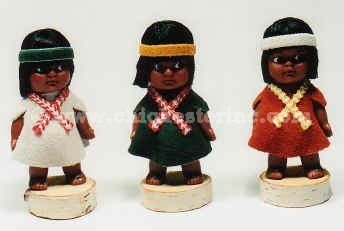 These adorable 5" papoose dolls on a suede cradle board are decorated with colorful braids, beads, and rabbit fur. Assorted colors. These cute girls stand 4" tall and come in assorted outfits. These dolls are NOT made by Native Americans. Assorted colors. These lovable dolls are trimmed with rabbit fur and are approximately 5" long. They come in assorted colors, so if you have a particular color in mind, please let us know when you order. These dolls are Non-Indian Made. For our listing of Native-Made Dolls, please click HERE.